The Valley Viking girls’ track and field team ran away with the girls’ title, while Raft River, Hagerman and Wendell battled for the top boys’ spot during Thursday’s 14-school Monte Andrus Invitational for 2A/1A small schools at Twin Falls High School. Led by freshman long/triple jump winner Brinley Reed and junior 800-meter/1600m distance victor Claribell Juarez, the Valley girls (147.5 points) piled up 54 points in field events, 57.5 in sprints/relays and 36 in distances. Raft River of Malta (124), Hagerman (115) and Wendell (107) topped the boys’ ranks. The Carey School girls made progress Thursday. The Panthers were fifth with 55 points topped by a first-place pole vault by Daphne Kirkland (6-0). Kirkland led off the second-place 4x100m relay with Clarissa Kirkland, Arriana Nielson and Kelsey Barker (55.90). A Community School runner, junior Sydney Hagenbuch, placed fourth in the 400m dash at 1:07.10. Carey sophomore Medin Cenarrusa ended up fourth in 300m intermediate hurdles (55.20) and was fifth in 100m high hurdles (18.30). Carey was competitive with third in 4x400m girls’ relay (4:48.40) featuring Shayla Adamson, Cenarrusa, Hailee Johnson and Barker. Johnson was fourth in long jump (14-4.5). The Carey boys placed ninth overall with 22 points led by relays and field events. 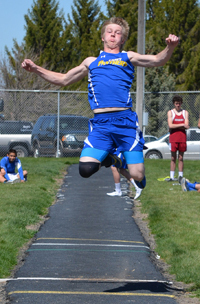 Sophomore Joe Parke was third in high jump (5-10) and junior Matt Whitworth fifth in discus (127-8). Taking third place was the 4x400m relay of Christian Zarate, Tori Alvarez, Collin Whitby and Parke (3:59.0). Wood River High School sophomore sprinter Michelle Mason ripped off a season-best 13.16-second time to win the 100-meter dash at Thursday’s 13-school Buhl Rotary Invitational track and field meet. Mason gave the Wolverines their only first-place finish of the day, but she was also an integral part of Hailey’s second-place 4x100m relay team along with Pilar Pennell, Lexi Browne and Sara Lichtenberg. Senior Janel Passey (2:31.74) in a thrilling 800m photo finish with senior Rachel Youren of Gooding (2:31.47); senior Mariah Stout in the 3200m (12:31.70); and from sophomore Bailey Rierden in triple jump (31-2). Placing third were Passey 1600m (5:49.17) and the 4x400m relay of Michelle Casas, Amy Cantrell, Kenya Schott and Passey (4:44.91). Schott finished fourth at 3200m (12:50.40) and Lichtenberg was fifth in the high jump (5-0) at Buhl. Wolverine sophomore Noah Russell placed sixth in 300m intermediate hurdles (46.40). Hailey junior Alexis Gonzalez placed third in the 3200m (10:32.70) and junior Taylor Douthit notched a pair of sixth places in shotput (39-3.5) and discus (124-3). Jerome (131) easily won the boys’ team title. Point-getters for Camas County of Fairfield on the Buhl track were senior Taylor Gorringe third in girls’ discus (106-10) and eighth in shotput (30-7); junior Isaac Simon fifth high jump (5-10) and sixth triple jump (38-5); and freshman Ariel Reedy sixth in discus (103-8).